Put the coconut milk in the fridge upside down the night before you plan on making this recipe. Chill the bowl you intend to use for the coconut whipped cream 15 minutes prior. 1) Start by taking out your Coconut milk from the fridge leave it upside down to open it, take the thick part out and put it in a chilled bowl and add your Cane Sugar. 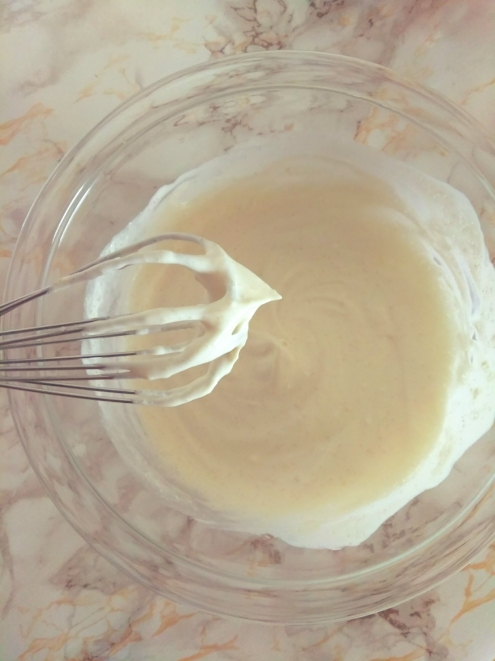 Whisk it together until it's light and the consistency of Whipped Cream. When your done cover it up and put it back in the fridge. Save the liquid that's in the can, you can save it for a smoothie for later. 2) Next cut the strawberries, then add Cane Sugar and stir them so the cane sugar is mixed evenly. Set them to the side and we'll start on the pancakes. 3) In a mixing bowl whisk together the water and oil then add it to your For the Love of Pancakes Mix. 4) Let the mix rest and begin heating your skillet on low-medium heat. You're ready to start when you sprinkle a couple drops of water and they sizzle. 5) Pour the Batter into the skillet in 1/4 cup scoops. Cook until you see small bubbles and the edges start to dry then flip. Cook for about 3 minutes on the other side. 6) Once the pancakes are finished add the coconut whipped cream and strawberries between each layer, and then some on the very top! These were Soooooooo good, once I was done taking pictures everybody dived into the plate adults and toddler included! This recipe is simple, quick and easy on a scale of 1-10 I give this a 13!! !